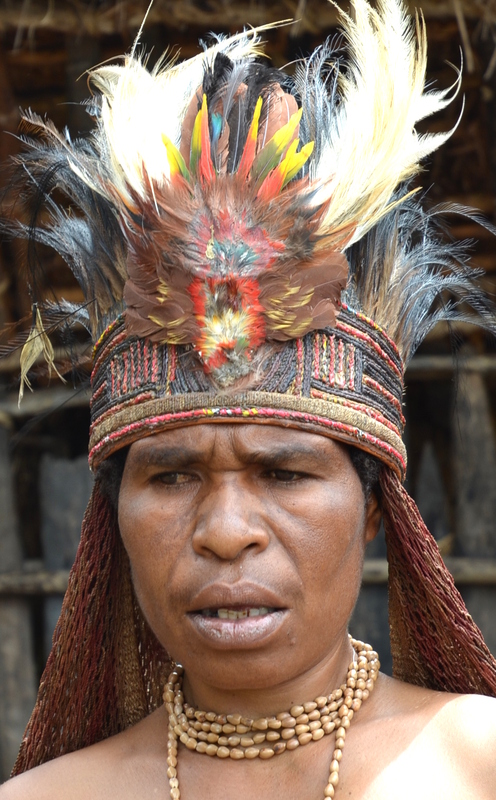 Barely clothed and wearing a feather headdress, a koteka, and fur arm bands were all each tribesman wore as he battled barefooted with men of another tribe. 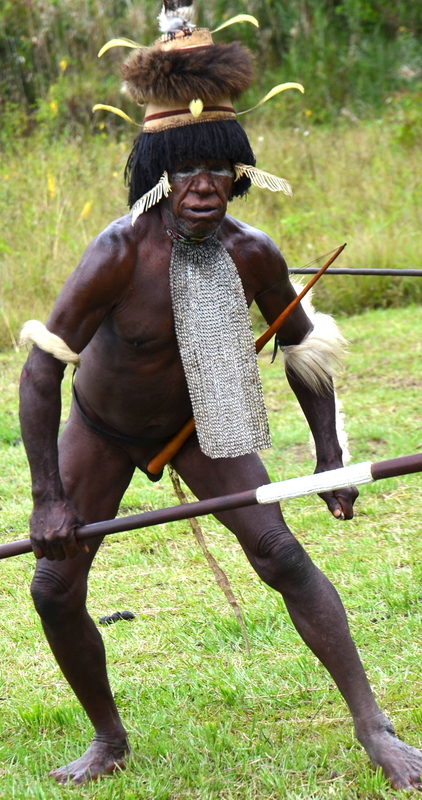 These tribesmen were the Dani of Papua Irian Jaya, also known as Papua, Indonesia, and they used spears and bows and arrows to fight others. 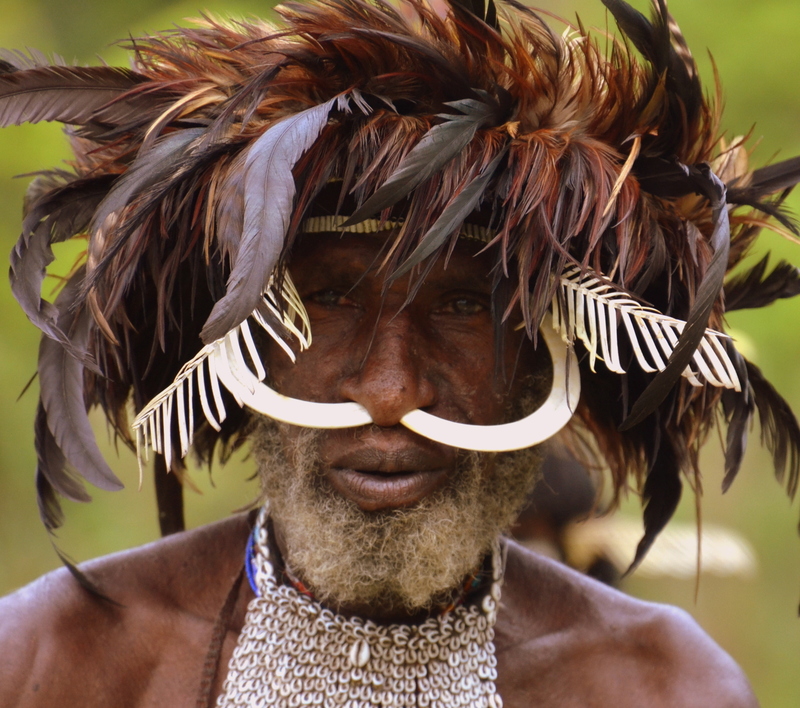 Several men wore a Wally Mo, a cowry shell tie indicating wealth and status as a village chief and others wore a pig tusk in their nose. As we approached the early morning battleground in the Baliem Valley, hollering was heard to get us to stop. 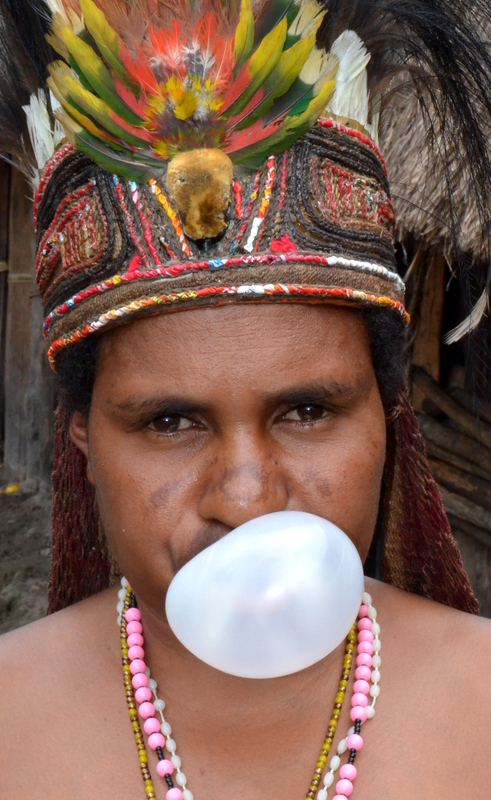 Not knowing what the sounds meant and where it was coming from, we finally noticed a Dani tribesman standing at the top of a 30-foot pole talking to us. When he discovered we were friendly, he welcomed us. The battle continued about 15 minutes after we arrived and then we were invited into the Dani village of 8 different families. 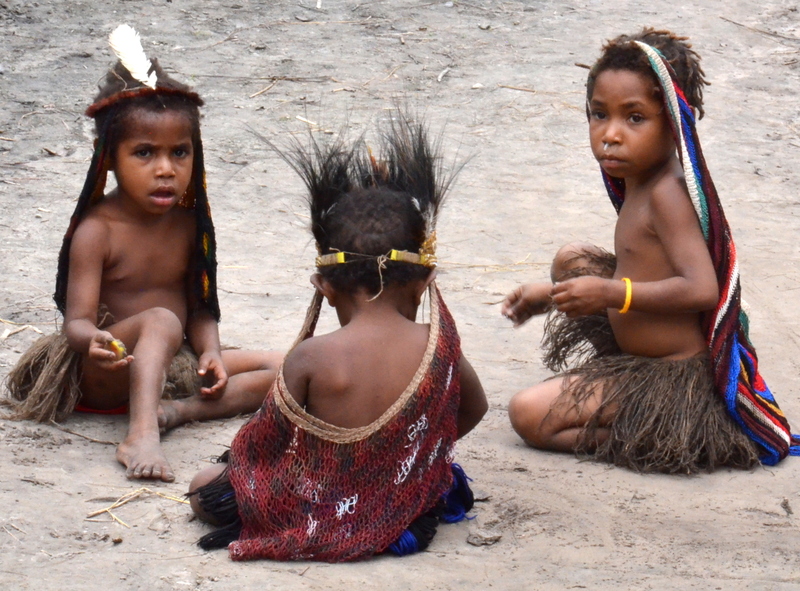 After clearing the door 3 feet from the ground without steps, we saw the Dani women waiting. 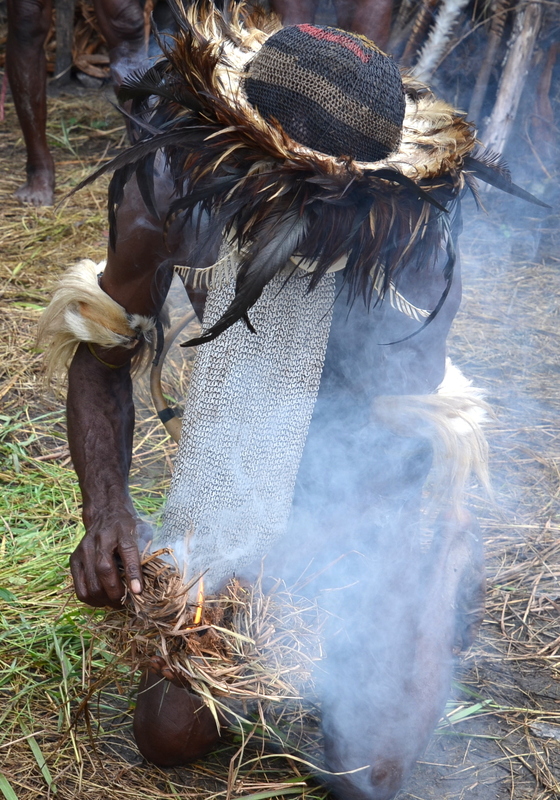 Dressed only in a skirt and beautiful headdresses made of bird of paradise, cassowary and ostrich feathers, the ladies welcomed us into their village with a dance. 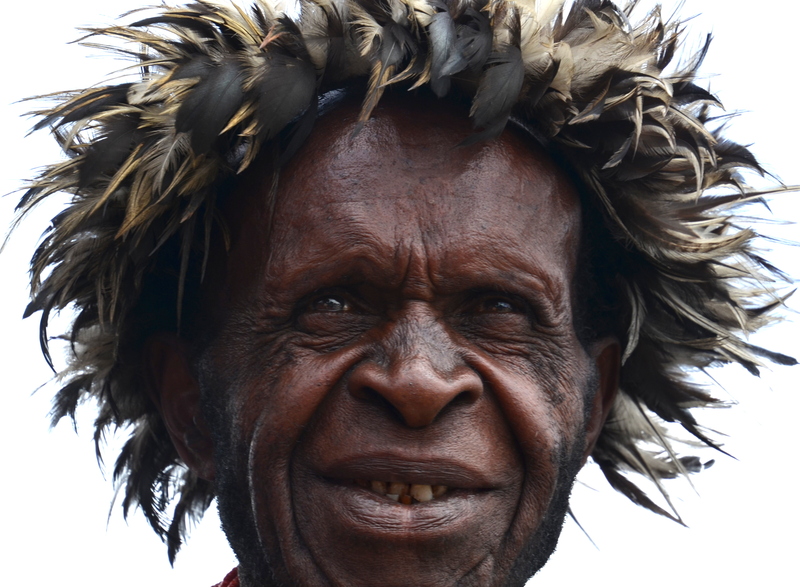 Going around and around in a circle, they chanted and sang to a traditional Dani beat. 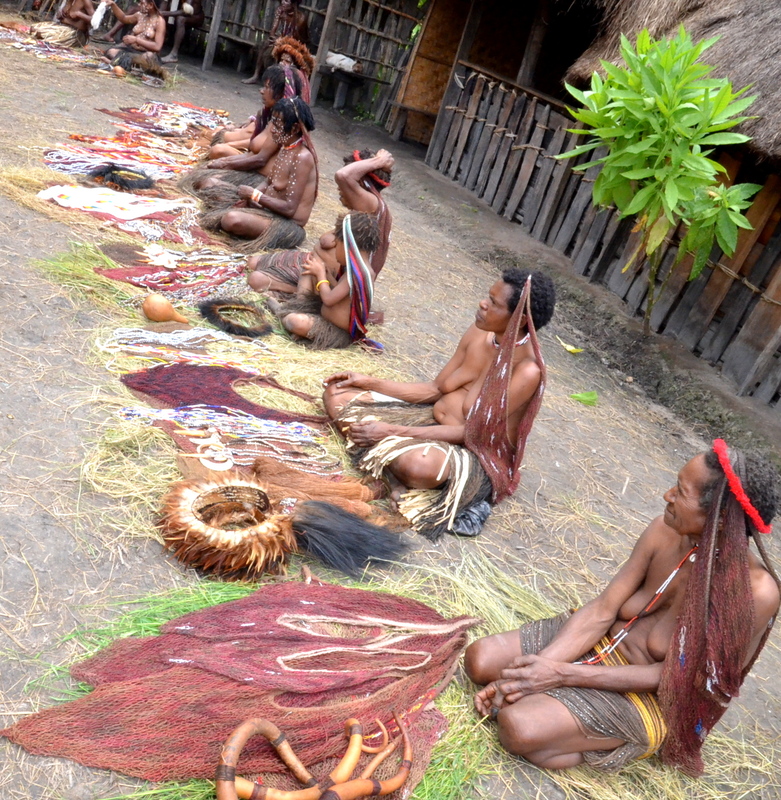 Their beautiful colorful skirts were made of tree bark and white grass or beads from orchid seeds worn loosely around the hips. After 15 minutes of dancing, it was time to start the feast. 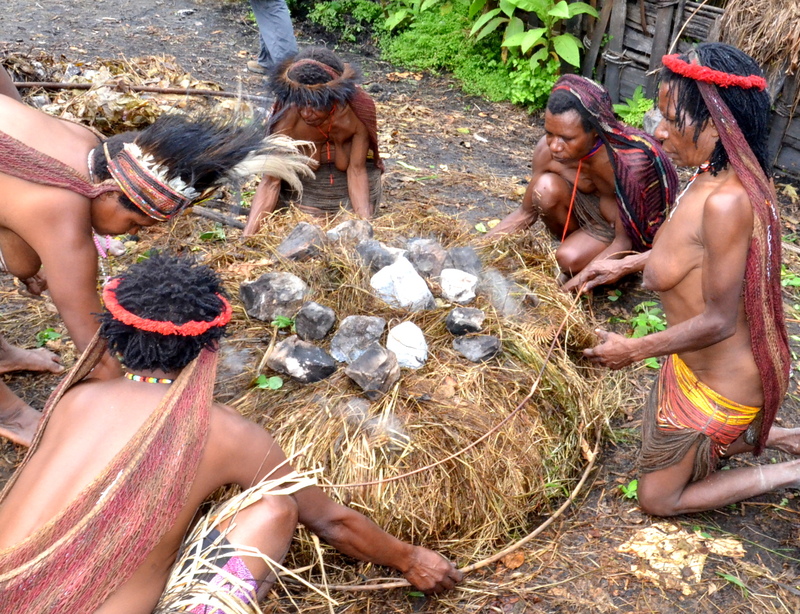 A tribesman started the fire by rubbing 2 sticks together in straw until a fire began. 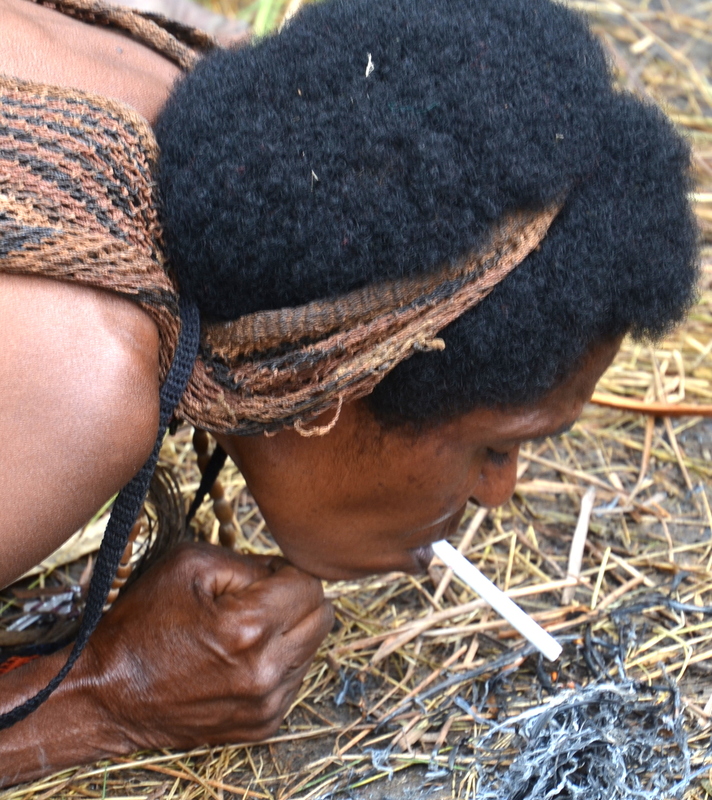 Immediately, a woman bent down to light her cigarette as did several others because everyone smokes in this Dani tribe and Indonesia. And for this feast, a pig had to be sacrificed as the Dani are Christian with animistic beliefs. 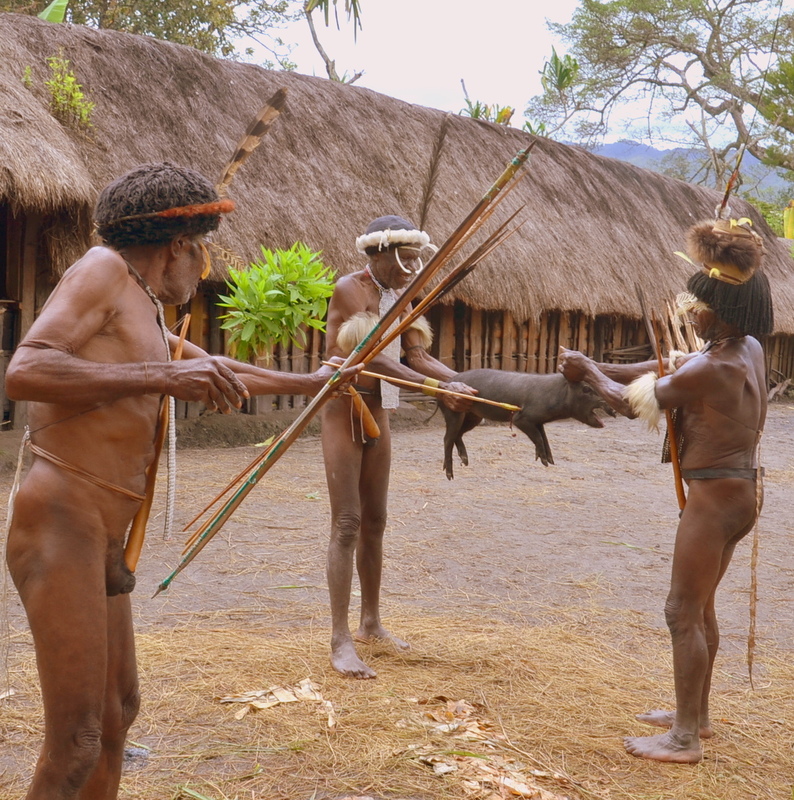 Held by 2 tribesmen, the pig squealed the entire time until the arrow hit is heart. 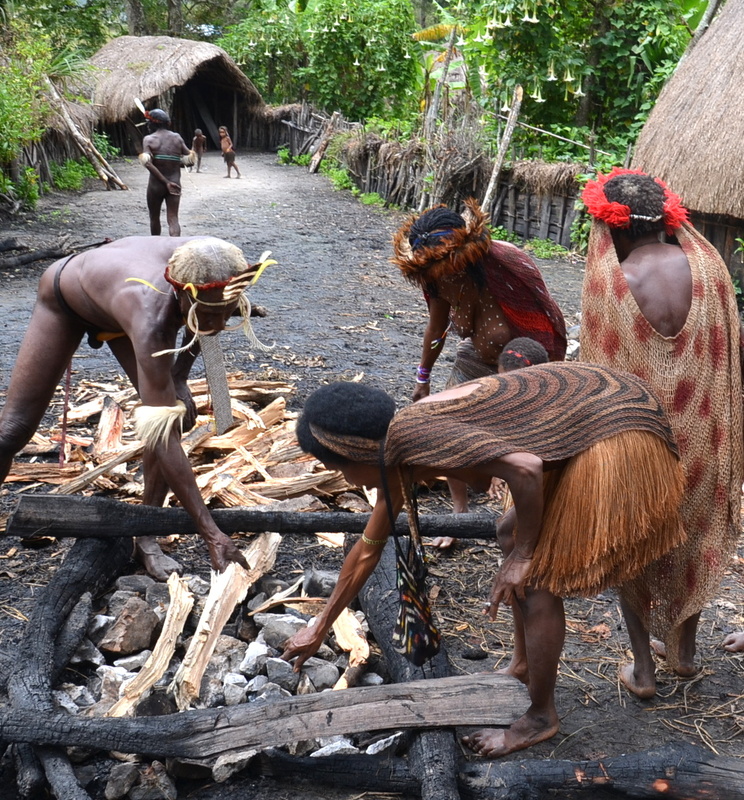 As this was going on, the ladies prepared the cooking pit in the ground using the fire started by the men. As the food was being prepared, the children were playing hop scotch with a rock and a grid scratched in the ground and chasing each other. At all times, the children were polite, charming and curious. 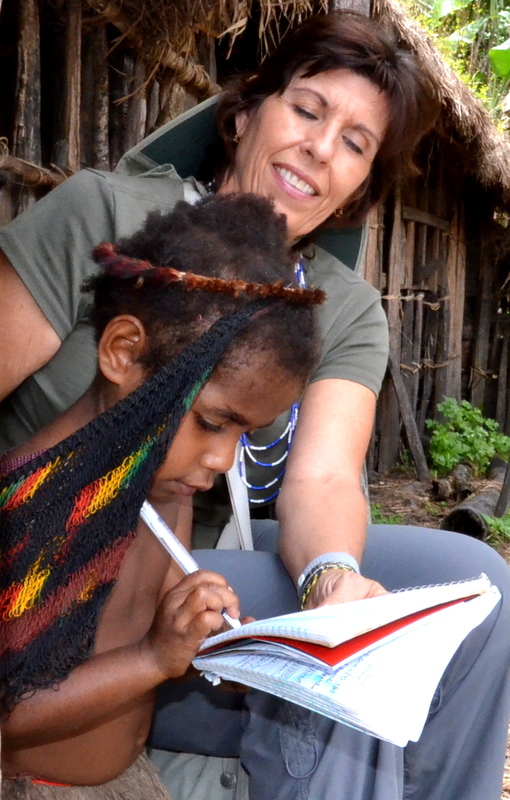 One girl wanted Denise to help her with English letters. Each girl begins wearing the sack from her head at age 1-2 and it remains there for life as it is tradition for the female to carry any kind of item in the sack, even a baby. The female teenagers stayed around quietly making crafts and eating. 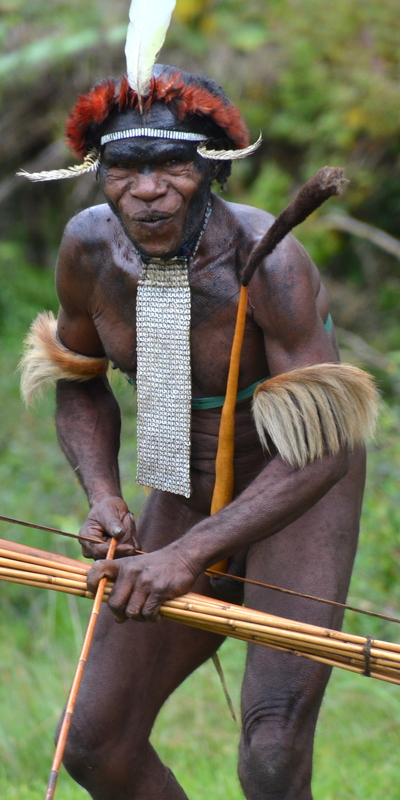 Young males are not carrying on the tradition of wearing the koteka. 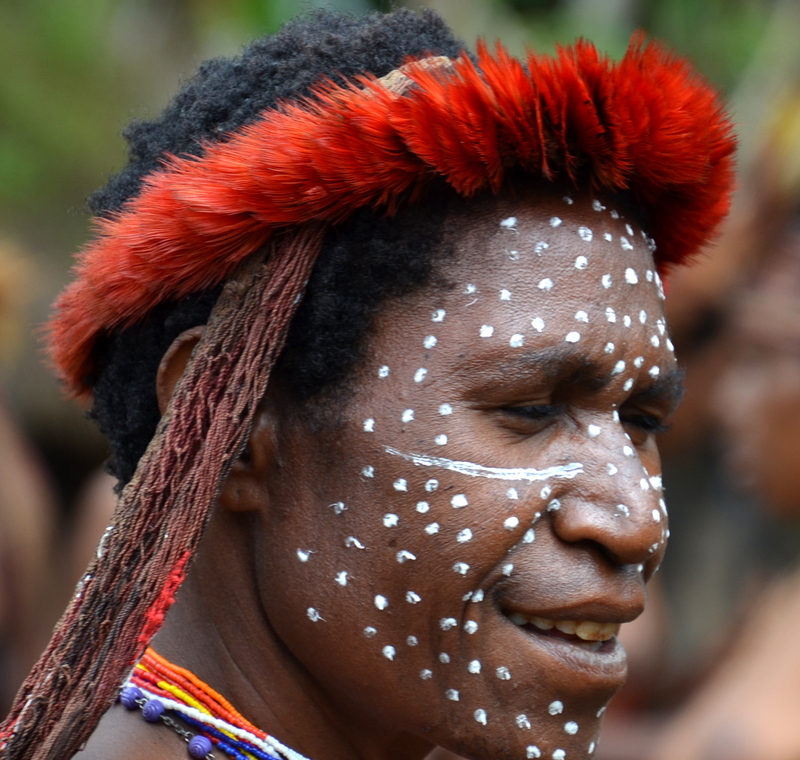 But between the age of 9-12, they go through an initiation ceremony of manhood which is held in the house only for men in the village. 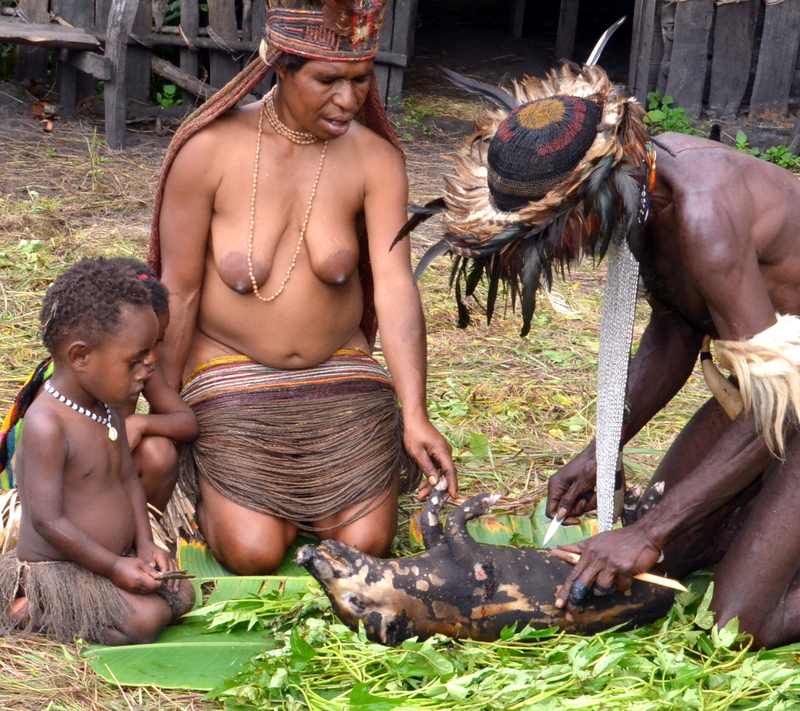 Circumcision is not performed but the koteka is installed and the young man wears it only for ceremonies now. 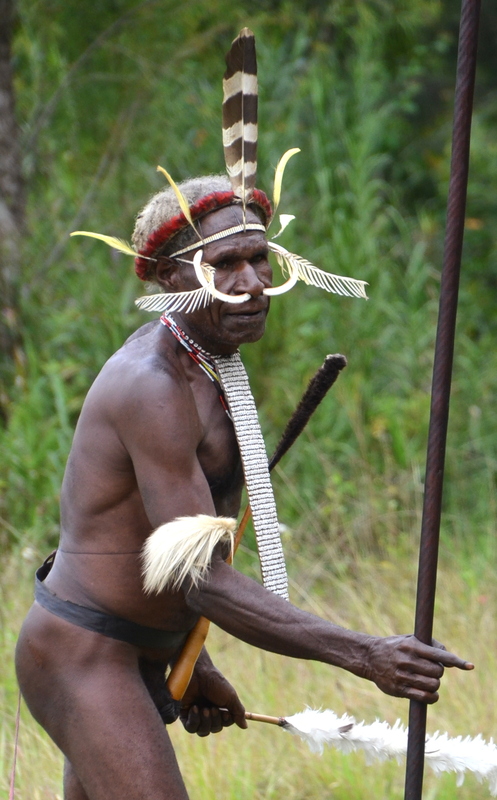 The rest of the time, he is dressed in western clothes just like the rest of the men in his Dani village. One young man wore it during the ceremony that we saw. 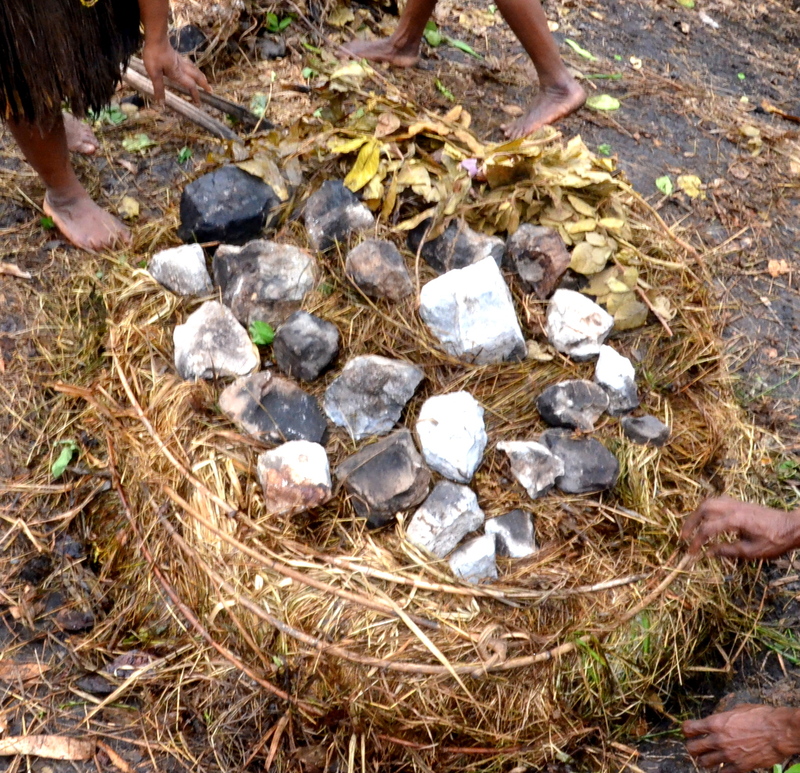 The feast preparation continued as the pig was cooked by itself in a pit of straw, wood and rocks over the fire. 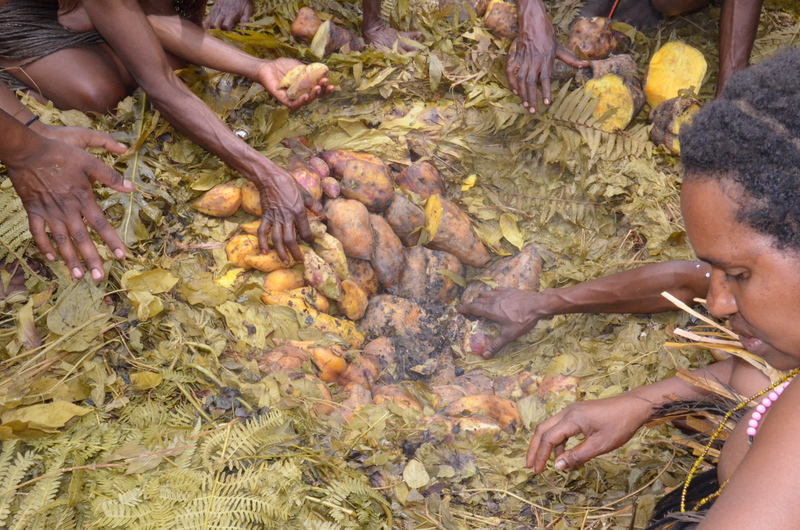 After 1 hour or so, it was removed and placed in the steam pit full of greens, sweet potatoes and other vegetables. The steam pit had hot rocks placed in it and then it was wrapped up tight to steam. About 3 hours later, the feast was ready for all to enjoy. 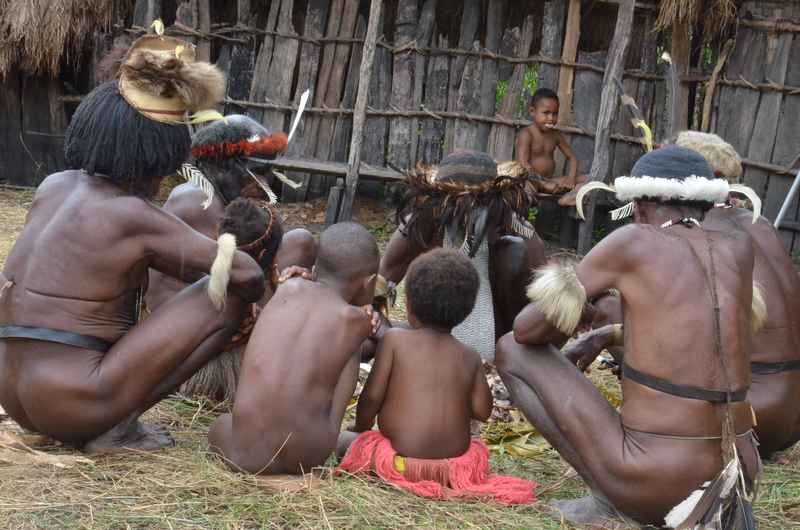 The children got the tiny bones to eat and chew and they joined the males in a circle to eat their meal. And the ladies offer others food as they sit in their circle and enjoyed the fruits of their labor. The sweet potatoes were delicious. Now, it was time for one more thing–the market. Each lady displayed items for us to buy. 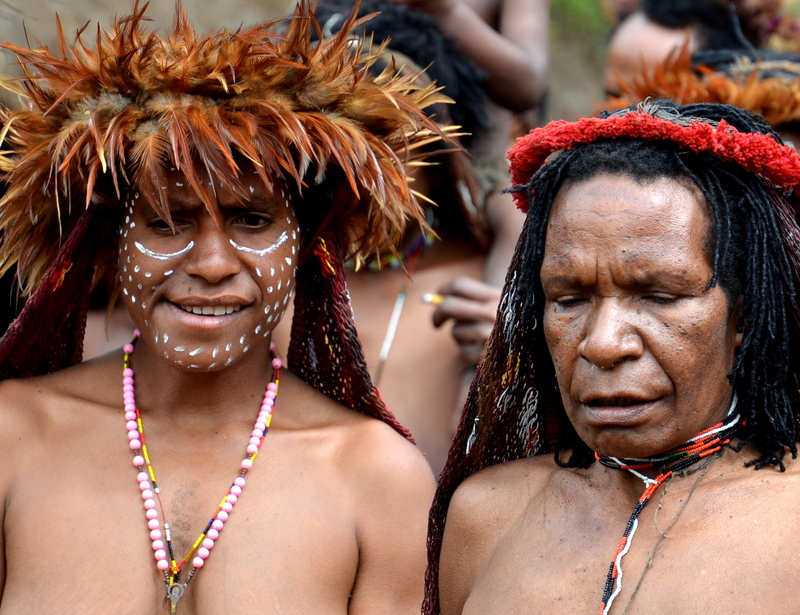 The entire traditional ceremony cost $400 USD, our Bestway Tours & Safaris guide told us, which is divided by 8 village families after all the yearly performances. Each family gets paid for the performances just once a year. 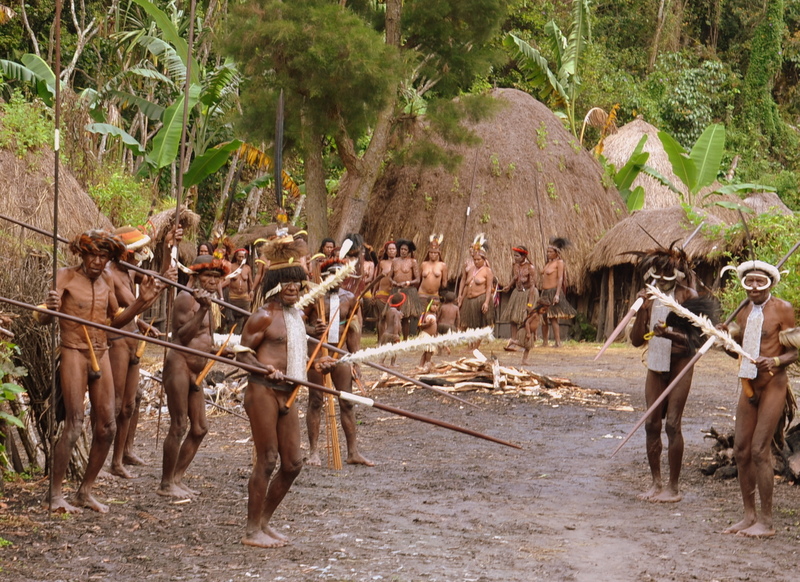 And then it was time for the afternoon traditional ceremony where they wear only the koteka, beautiful headdress, maybe the Wally Mo for the chief and battle barely clothed and barefooted with another tribe using swords, bows and arrows. And then they feast. 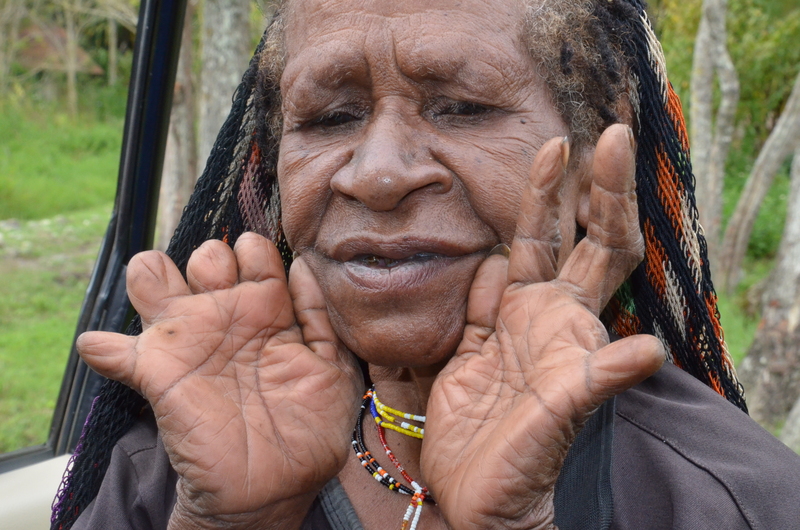 It is traditional for Dani women to cut off part of their fingers upon the death of close family members. This shows the grief the lady will bear her entire life. Good story. Super pix! Fun read! Very much enjoyed the pics & your story as I reminisced my visit to this tribe, recognized many of the people, especially the Chief, as they were much younger in Oct.1996. One of my most memorable experiences!